Whether you’re getting ready to celebrate Canada Day or the 4th of July, summer is all about patriotism! Show off your country pride with a few fun patriotic crafts for kids and adults! More than a few, actually. 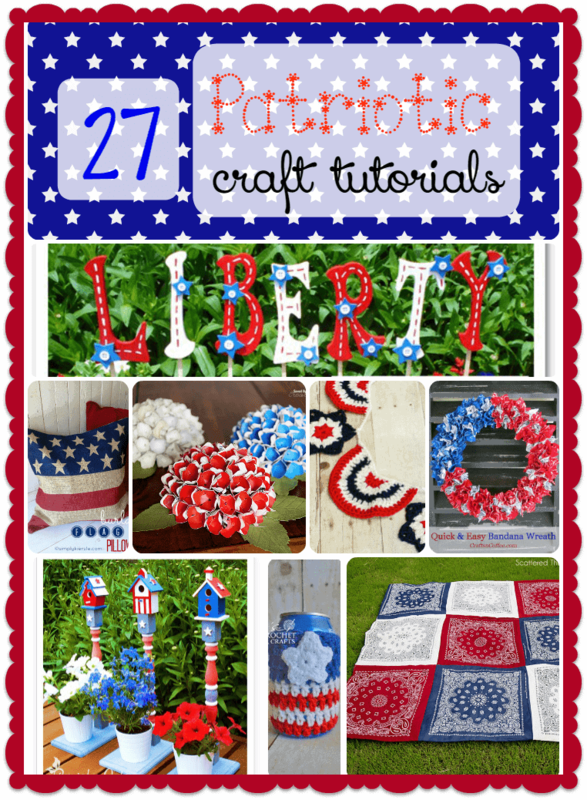 We have 27 different great patriotic crafts from all our favorite bloggers to get you in the spirit! While many of these are geared towards the US Flag colors, they can easily be tweaked to make beautiful Canada Day crafts by leaving out the blue parts. Check them out! Whip up a few of these 4th of July Shirts from Make it & Love it, with adorable ruffles, buttons and bows! Finish off the adorable look with Bless This Mess Please’s Patriotic Headbands made from old t-shirts. Easily adapted for Canada Day, just use red and white t-shirts! For your feet, try making over your flip flops with this fun DIY Ribbon Flip Flops craft from About a Mom! Squishy Cute Ideas shares two super cute ideas: a Patriotic Birdhouse Craft and fun Patriotic Picnic Containers using old tin cans and felt! Keep your picnic drinks cold in Katie’s Crochet Goodies’ USA Cozy Pattern! Make these DIY Patriotic Paint Chip Hydrangeas by Saved by Love Creations, perfect for those who aren’t great at growing real flowers! While you’re visiting, check out her Upcycled Hubcap Patriotic Star Wreath! So cute! Looking for more wreath ideas? Check out Crafts ‘n Coffee’s Easy Patriotic Wreath! Bliss Bloom Blog share a pretty Flag Table Runner for your picnic table! Learn How to Make a Bandana Quilt from Scattered Thoughts of a Crafty Mom and make a great heirloom piece to pass down through generations! Make this Burlap Flag Pillow by Simply Kierste to go along with it. Holiday Crafts and Creations whipped up this fun and easy Patriotic Yard Sign to tell the world that she loves her country! Crafting in the Rain decks out her walls with this Herringbone Wall Art and lights her path with these pretty Flag Candles! Use votive candles and put them in Crafts Unleashed’s Patriotic Votive Candle Holder. Swap out the stars for Maple leafs to make this a fun Canada Day craft! Wait Until Your Father Gets Home plants her flowers and herbs in style with a Star Spangled Planter. Looking for more decorations for your windows and walls? Check out Club Chica Circle’s DIY Patriotic Window Clings and At Home With Sweet T’s USA Paller Wall Art. Meaningful Mama’s American Flag Collage is also fun for you and the kids to make together. Simply Kelly Designs has fun DIY Temporary Tattoos that the kids will love! Speaking of kids, before heading to the parade, make this Patriotic Duck Tape Parade Stick craft from Crafts by Amanda! 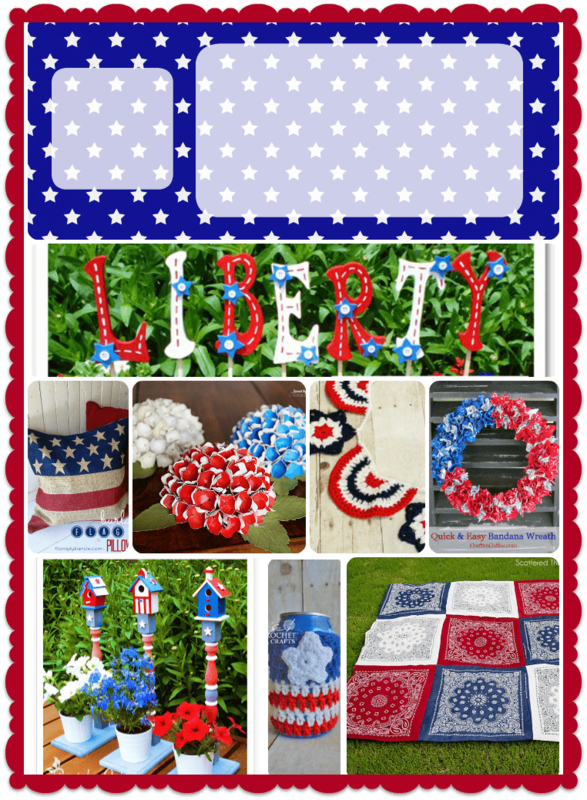 Round out your Patriotic crafts fun with this American Flag Pallet from Mommy is Coocoo! Phew! That’s a lot of Patriotic crafts! You’ll be crafting from now until the 4th with all of those! Which one is your favorite? Tell us in the comments! Miami Dolphins Bullying: What Kind of Message Does it Send Kids? I love these fourth of July decorations. I love to make things at home. I will have to try the wreath for this year. These are great fourth of July decorations. It is also my daughters birthday so we have a lot of birthday decorations we always out up. Such cool ideas. I love them..very nice ideas. So many great ideas! I love handmade wreaths, they are so pretty! what fun and cleaver ideas. i really like the bandana quilt! Great craft ideas! I love those patriotic bird houses. It would be so fun to paint some up for my own yard like that. Fourth of July is coming up fast. My kids are bored with summer already. I should get them making some of these decorations. These are some very awesome, creative ideas. I need to get started planning, as it’s just around the corner! I love all of these ideas. I think it’s a lot of fun to make patriotic crafts with my girls. We always enjoy it. I can’t believe the 4th of July is coming up so quickly! Oh what total fun. I love doing crafts with the kids and these sound like fun… Thanks for sharing. Oh, a couple of these are PERFECT for a tablescape that I need to create. Love LOVE <3 the idea of using bandanas! It would be great to try as many of these as possible! the burlap flag pillows are so cool looking! What cute patriotic things to make! I cannot believe 4th of July is just around the corner! Those bird houses with flower pots are really cute. I need to make one for my mom! It looks like summer! Thank you for including the Easy Bandanna Wreath from CraftsnCoffee.com. I love those patriotic bird houses. I could see one of those sitting in my front yard! These are such cute crafts!! I can’t believe its almost time for the Fourth of July! Cant wait for the 4th. Kids want to already get fireworks. The quilt looks fun! These are great! I love those birdhouse planters. Those are all great ideas. I want to try a few with the kids!